[Image: Haus-Rucker-Co, Grüne Lunge (Green Lung), Kunsthalle Hamburg (1973); photo by Haus-Rucker Co, courtesy of the Archive Zamp Kelp; via Walker Art Center]. A time of great upheaval, this period witnessed a variety of radical experiments that challenged societal and professional expectations, overturned traditional hierarchies, explored new media and materials, and formed alternative communities and new ways of living and working together. During this key moment, many artists, architects, and designers individually and collectively began a search for a new kind of utopia, whether technological, ecological, or political, and with it offered a critique of the existing society. While the exhibition and its accompanying, very nicely designed catalog are both worth checking out in full, my post looks at a specific project by Haus-Rucker-Co called Grüne Lunge (Green Lung), seen in the above image. [Image: Haus-Rucker-Co, Oase Nr. 7 (Oasis No. 7), installation at Documenta 5, Kassel (1972); via Walker Art Center]. Put into the context of Haus-Rucker-Co’s general use of inflatables, as well as today’s emerging fresh-air market—with multiple links explaining this in the actual post—I suggest that what was once an almost absurdist art world provocation has, today, in the form of bottled air, become an unexpectedly viable business model. In any case, check out the post and the larger Hippie Modernism exhibition if you get the chance. [Image: A Starfish site, like a pyromaniac’s version of Archigram, via the St. Margaret’s Community Website; view larger]. 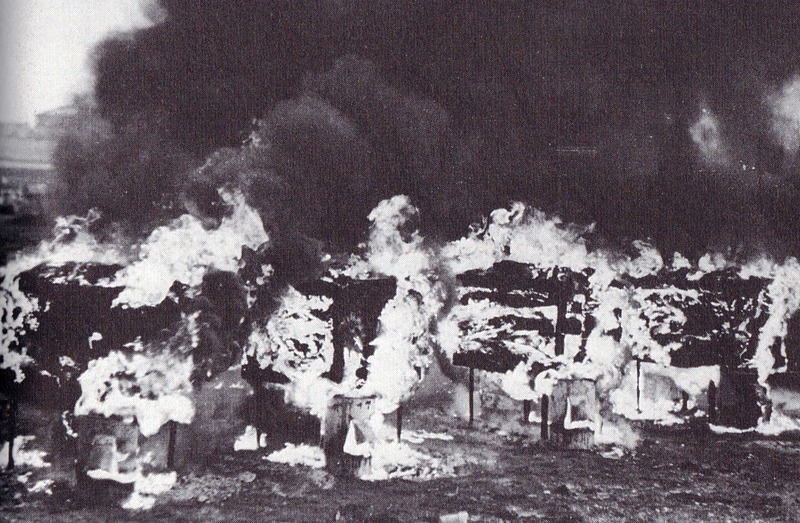 [Image: A Starfish site burning, via the St. Margaret’s Community Website; view larger]. 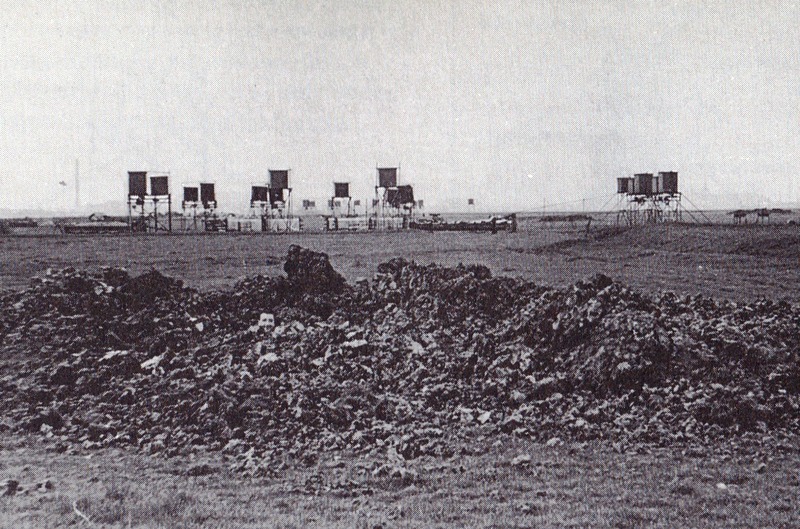 As English Heritage explains, in their list of “airfield bombing decoys,” these misleading proto-cities were “operated by lighting a series of controlled fires during an air raid to replicate an urban area targeted by bombs.” They would thus be set ablaze to lead German pilots further astray, as the bombers would, at least in theory, fly several miles off-course to obliterate nothing but empty fields camouflaged as urban cores. They were like optical distant cousins of the camouflaged factories of Southern California during World War II. [Image: Zooming-in on the Starfish site, seen above; image via the St. Margaret’s Community Website]. The specific system of visual camouflage used at the sites consisted of various special effects, including “fire baskets,” “glow boxes,” reflecting pools, and long trenches that could be set alight in a controlled sequence so as to replicate the streets and buildings of particular towns—1:1 urban models built almost entirely with light. The remarkable photos posted here—depicting a kind of pyromaniac’s version of Archigram, a temporary circus of flame bolted together from scaffolding—come from the St. Margaret’s Community Website, where a bit more information is available. (Thanks to Laura Allen for first pointing me to Starfish sites). [Images: The micro-culture of the motorway; images courtesy Associated Press/Wall Street Journal]. It was hard to miss the story last month that a 62-mile long traffic jam had formed in China, becoming a near-permanent feature of that nation’s roadway system. It lasted nine full days, in a state of almost perfect gridlock. NPR reported that drivers simply turned off their cars and slept for 8 hours at a time. [Images: The traffic jam as scene from Dante; images courtesy Associated Press/Wall Street Journal]. But what if another such traffic jam were to form again? Where role might there be for architecture? Clip-on awnings, zip-up tent walls, velcro-connected halls and corridors spanning car-to-car and truck door to truck door, even crawlable tunnels for kids, with mobile parks on flatbed trucks, whole canopies held down by duct tape, antennas repurposed as anchors for tarps and makeshift roofs. Outdoor cinemas are formed. Social cliques develop. The spatial infrastructure of the permanent traffic jam kicks in: guerrilla, unfoldable, pack-into-a-backpack-able, made from lightweight materials—ripstop fabrics and military-grade rope—a city takes shape on the highway, with every car, bus, truck, and motorcycle a luxury room or repurposed piece of home furniture. [Image: Courtesy of Newscom and the Christian Science Monitor]. Lock this in place a few years and give it a postcode. Children are born there. Like Dan Hill‘s quip that “There are 500000 people airborne at any one time. A drifting airborne city, the size of Helsinki, a few meters tall, threaded around [the] globe,” this city-on-the-road would be named, memorialized, revisited. New highways would simply thread around it, abandoning the vehicles to their stationary fate as their tires drain of air and engines stall forever. Generations later, the fact that, down in the mud and dust beneath your metropolis, you can find abandoned frames and chassis from the city’s founding traffic jam, will be impossible to believe—a run-of-the-mill urban legend. Archaeologists will argue over the best sites to excavate to find truck doors and ancient oil spills down there in the formerly mobile foundations of the city. On the level of architecture, then, what could we do to prepare for the impending return of the near-permanent Chinese traffic jam? What prosthetic walls, floors, ceilings, and corridors—what new families of clip-on architectural forms—could we explore? Traffic Walls™—an instant city brought to you by North Face and the GA Tech School of Architecture. Easily deployed. Houses up to 10,000 people. Machine-washable. [Image: “Beamer Bees” by Liam Young and Anab Jain]. I had an interesting and long conversation last week with John Becker, one of my students at Columbia’s GSAPP, about everything from the future of 3D printers, the possibility of permanently embedding such machines into the fabric of a building, and even the genetic manipulation of nonhuman species so that they could produce new, architecturally useful materials. For instance, what if Enrico Dini’s sandstone-printing device—so interestingly profiled in Blueprint Magazine last month—could be installed somewhere at the heart of a building complex—or up on the roof, or ringed around the edge of a site—where it could left alone to print new rooms and corridors into existence, near-constantly, hooked up to massive piles of loose sand and liquid adhesives, creating infinite Knossic mazes? The building is never complete, because it’s always printing itself new rooms. In fact, I think we’ll start to see more and more student projects featuring permanent 3D printers as part of the building envelope—and I can’t wait. A room inside your building that prints more rooms. It sounds awesome. 2) Several months ago, the Canadian Centre for Architecture, as part of their exhibition Actions: What You Can Do With the City, put up #77 in its list of things “you can do with the city”: they phrased it as Bees Make Concrete Honey. My eyes practically fell out of my head when I saw that headline, imagining genetically modified bees that no longer produce honey, they produce concrete. They’d mix some strange new bio-aggregate inside their bellies. Instead of well-honeyed hives, you’d have apian knots of insectile concrete. Perhaps they could even print you readymade blocks of ornament: florid scrolls and gargoyle heads, printed into molds by a thousand bees buzzing full of concrete. Bee-printers. Alas, it had nothing to do with apian concrete; it was simply a play on words: urban bees make urban honey… or concrete honey, if you want to be poetic. But no matter: using bees to create new forms of concrete—perhaps even new forms of sandstone (whole new geologies! )—is ethically horrific but absolutely extraordinary. After all, there are already bugs genetically modified to excrete oil, and even goats that have been made to produce spider silk.